As the days move on, Pakistan Tehreek-e-Insaf's Azaadi march gathers more momentum. PTI Chairman Imran Khan is adamant about his claims that the elections were rigged and Nawaz Sharif and PML-N must answer for this. Included in the list of demands was Prime Minister Nawaz Sharif's immediate resignation from his post. However, whether PTI's claims are justified or not or whether PML-N is causing Pakistan's economy and solidarity major damage by not proposing a viable solution to this remains to be see. But what we have seen, is that all the Pakistani media channels are scrambling to get the best coverage of Azaadi March as it is the trending, newsworthy event of present. Every channel you turn to has been raving about the protest and Imran Khan's inspirational and determined role in it. Well, every channel except Geo Tv and PTV. It is strange to see Geo who claim to be on top of every news story in Pakistan staying on the sidelines and not once accurately portraying the Azaadi march. PTV is understandably staying neutral in all this, but a bit more coverage would definitely be appreciated. Back to Geo, the only time they have mentioned the Azaadi March is when they have to say something negative about it. 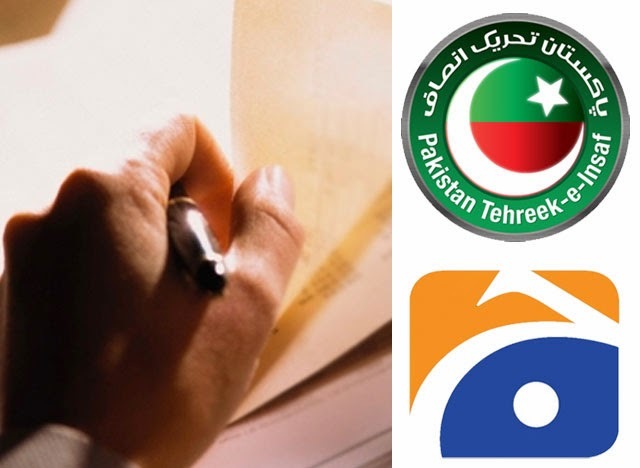 Maybe Geo Tv has something personal against Imran Khan and PTI but media ethics dictate that a channel should report the news accurately and fairly to the best of its ability and not use the news for personal agendas. As an avid media follower, I have to say I am extremely disappointed in Geo Tv.